The diabolical ecumenical movement is many decades old now. But since a Jesuit cardinal from Argentina became the Roman Pope Francis I, ecumenists from the Charismatic/Pentecostal and so-called “Evangelical” camps have been showing a more-than-usual unseemly haste to heap praise on the papal head and to rush to Rome to receive his “blessing” (curse). And thus the Romeward movement has received another major boost. We saw it earlier in 2014 when Charismatic con-man, Kenneth Copeland, broadcast Francis I’s message to Charismatics on a giant screen, at his “church”. 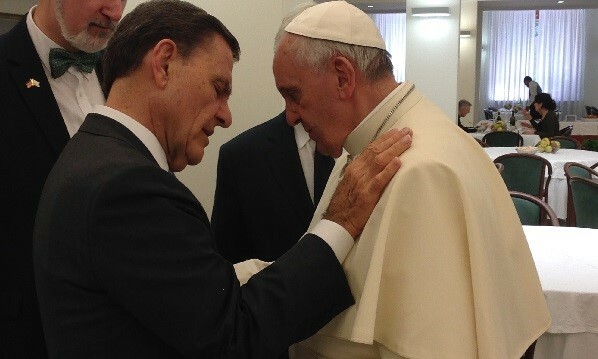 I analysed this in my article, Copeland in Popeland: Kenneth Copeland Embraces “Unity” with the Roman Pope. Francis spoke of his yearning for the separation between Papists and Protestants to come to an end, called the Charismatics “brothers”, asked them to pray for him, and said “the miracle of unity has begun.” As for Copeland, that Charismatic arch-deceiver immediately began to pray for Francis, and for “unity”. In this he was joined by the assembly who watched the giant screen, all praying in what they falsely believed to be “unknown tongues”. Then in July 2014 the next act in the unfolding drama occurred: a delegation of prominent “Protestants” from the USA and Canada winged their way to the seven-hilled city (Rev. 17:9) for a private audience and luncheon with Francis that lasted for over three hours! Who was in this delegation of deceived souls? 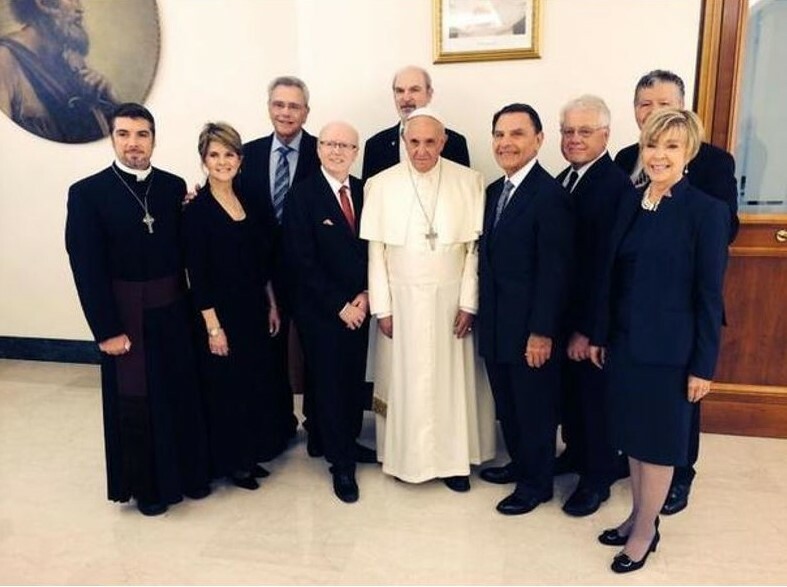 Kenneth Copeland was there – blubbering with praise for Francis and full of gratitude for the “world exclusive” he was able to broadcast when the Papal Antichrist had that special message recorded and sent to him to play to his followers. James and Betty Robison were there – the co-hosts of the Life Today television programme. James Robison was one of the first Southern Baptist ministers to openly proclaim he had “received the baptism of the Holy Spirit” – i.e. he had become a Charismatic. Geoff Tunnicliff was there – CEO of the World Evangelical Alliance (nothing Evangelical about it). Brian Stiller and Thomas Schirrmacher were there, also from the World Evangelical Alliance. John Arnott and his wife Carol were there – co-founders of Partners for Harvest Ministries in Toronto, Canada. 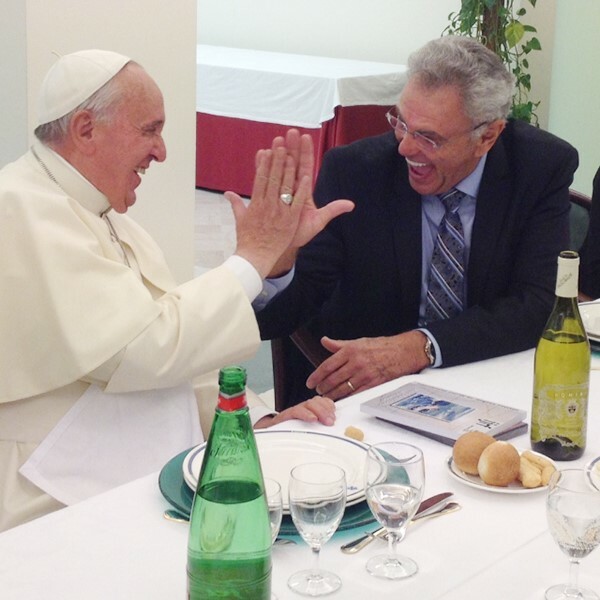 During the meeting, James Robison received a “high-five” from Francis after Francis and the “Protestants” talked about the need for all people to have a “personal relationship with Christ”. Listen to the fawning Francisolatry that gushed from Robison’s mouth, which will make any true Christian feel ill. He said: “This meeting was a miracle…. This is something God has done. God wants his arms around the world. And he wants Christians to put his arms around the world by working together.” This is all heretical nonsense. None of those assembled in that heathen temple of the Antichrist in Rome were true Christians anyway; and any meeting between Antichrist and other religious wolves is not a miracle of God, but a work of the devil. Working with Antichrist is never the will of God for true Christians: 2 Cor. 6:14-18. And whatever god Robison worships, it is not the sovereign God of the Bible, who created the heavens and the earth and who says in His Word, “The heaven is my throne, and the earth is my footstool” (Isa. 66:1) – He rules His entire created universe with almighty power. Therefore to say He wants Christians to put His arms around the world by working together, as if He is some feeble creature needing their help to encircle the world, truly is heretical nonsense. Robison added that he was impressed by the humility of Francis towards the delegation. To which we must ask: what exactly was so humble about the man? There he was, dressed in white because he claims to be the universal chief shepherd, receiving the delegation in the most ostentatious palace occupied by any religious leader anywhere on earth, accepting the title of “His Holiness”, claiming to be the vice-Christ on earth – and Robison in his spiritual blindness calls this man humble? If this is humility, one wonders what it would take for Robison to call any man proud and haughty. But he didn’t stop there. In a written statement, Robison said he believed “the prayers of earnest Christians helped lead to the choice of Pope Francis”, this “humble man… filled with such love for the poor, downtrodden…” I have written in other articles about why this man was chosen to be Roman pope, and the choice had nothing to do with “the prayers of earnest Christians”, for true Christians did not, and would not, pray for any man to become Roman pope. As for having love for the poor and downtrodden: real love is expressed by much more than patting people on the head, embracing them, and sending them kind wishes. What about Jesus’ words to the rich young man: “If thou wilt be perfect, go and sell that thou hast, and give to the poor, and thou shalt have treasure in heaven” (Matt. 19:21)? Francis is the wealthiest individual on the face of the earth, the public head of the wealthiest religio-political organisation on the face of the earth, a million times richer than that young man Jesus addressed. Do we see Francis selling what he has to give to the poor? No, and we are not going to, either. True believers boldly witness against Popery and the Papal Antichrist – they don’t sit down to a jovial, brotherly, high-five-slapping lunch with him! Yes, the Lord Jesus ate with publicans and sinners; but He did so in order to preach the Gospel to them: He did not treat them as spiritual brethren, joke with them, and discuss “unity” with them! Multiplied millions of believers have perished through the centuries on the orders of the popes of Rome – and yet these deceived, blinded, deluded and treacherous “Evangelicals” (falsely so called) and Charismatics sat down to lunch with the present incumbent of the papal throne as if they were all brethren in Christ! (They are brethren, yes, but not brethren in Christ). They ate a meal with the head of the most blood-stained institution to ever disgrace the face of the earth. What evil men! They did not betray true believers in Christ, for they are not true believers themselves and they do not represent true believers, but they certainly betrayed their own blinded followers.